A very exciting announcement came from Israel Aerospace Industries (IAI)’s MBT Space facility in Yehud, Israel, nonprofit SpaceIL and IAI when they announced a lunar mission will launch from Cape Canaveral, Florida, this December, and land on the moon on February 13, 2019. They stated that a final launch date will be announced closer to the event. The project has been made possible with the assistance of some generous donors, not the least by SpaceIL's President Mr. Morris Kahn who donated US$27 million. 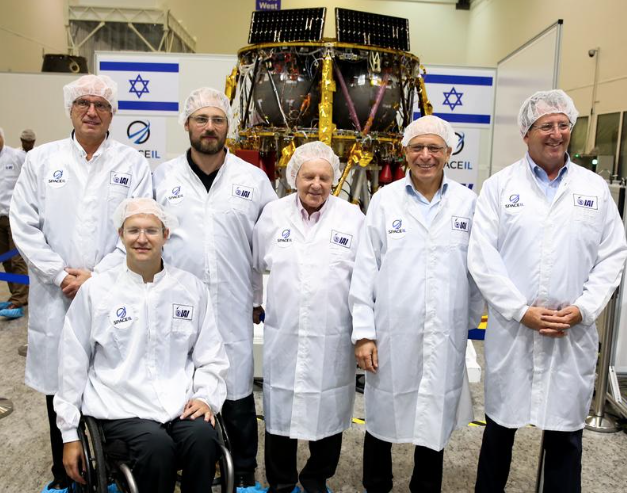 The first Israeli lunar spacecraft in the clean room. Mr. Morris Kahn, President of the non-profit organization SpaceIL said that after eight challenging years, he is filled with pride that the first Israeli spacecraft, which is in its final construction and testing phases, will soon be making its way to the moon. He had experienced numerous challenges in his life, but this was the greatest challenge of all. This is a huge achievement for them – SpaceIL – and for their partners, Israel Aerospace Industries, who have been with them since day one. The launch of the first Israeli spacecraft will fill Israel, in its 70th year, with pride. It is a national accomplishment that will put them on the world’s space map. 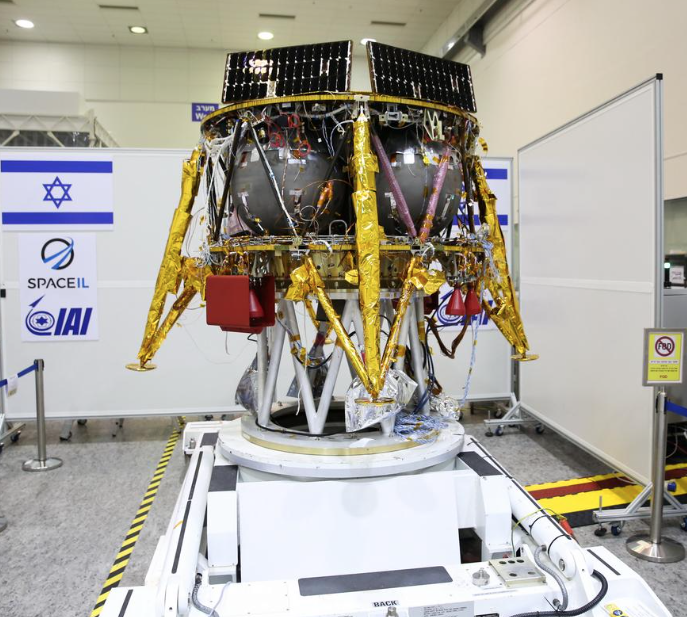 Dr. Ido Anteby, SpaceIL CEO added that SpaceIL, in collaboration with IAI, is embarking on the final leg of its complex mission to land the first Israeli spacecraft on the moon. In the coming months the spacecraft will undergo a series of intensive checks and tests at IAI, to prove that it will withstand the launch, flight and landing conditions. The excellent teams of SpaceIL and IAI are working with determination to complete this unique technological challenge in time for the launch date this December. 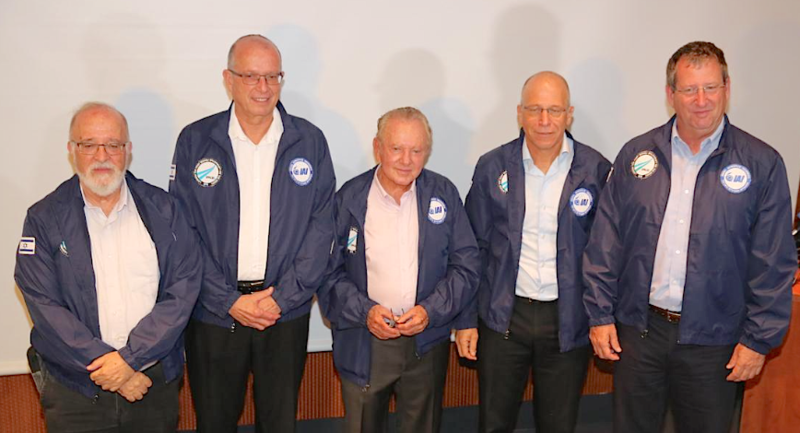 (right to left) Head of IAI’s space division, Head of IAI’s space division, Ofer Doron, SpaceIL CEO Dr. Ido Anteby, president of the non-profit organization SpaceIL Morris Kahn, Space IL founder Kfir Damari, SpaceIL founder Yariv Bash, and Aviad Shmaryahu of the Israel Space Agency. Mr. Josef Weiss, IAI CEO concluded that as one who has personally brought the collaboration with SpaceIL to IAI, he regards the launch of the first Israeli spacecraft to the moon as an example of the amazing capabilities one can reach in civilian space activity. The State of Israel, which is already firmly planted in the realm of space in its military activity, must harness resources for the benefit of civilian space, which is an engine of innovation, technology, education and groundbreaking around the world. The accomplishment they will soon achieve is the fruit of intensive labor of many years, of the best of minds. Reaching such an achievement specifically during Israel’s 70th year symbolizes how far they have come, and particularly the endless accomplishments that they can still achieve. IAI will continue doing all that is needed in the coming months to ensure the success of this national mission. Although this is an historic national achievement, it is essentially a private initiative by the three SpaceIL founders — Yariv Bash, Kfir Damari and Yonatan Winetraub — who strived to fulfill the dream of reaching the moon, and registered for the challenging Google Lunar XPRIZE competition. (right to left) Head of IAI’s space division Ofer Doron, SpaceIL CEO Dr. Ido Anteby, president of the non-profit organization SpaceIL Morris Kahn, IAI’s CEO, Josef Weiss, and chairman of the Israel Space Agency Prof. Isaac Ben-Israel. The spacecraft’s design and development process, which involved intensive work of engineers, scientists and team members, began in 2013 and continued until last year, when its construction at the IAI MABAT Plant commenced. The spacecraft, which weighs only about 600 kilograms, is considered the smallest to land on the moon. It is 1.5 meters, or over 4.9 feet high, 2 meters or six-and-a-half feet in diameter, and the fuel it will carry will comprise some 75 percent of its total weight. Its maximum speed will reach more than 10 km per second (36,000 kilometers, or nearly 22,370 miles, per hour). SpaceIL aims to set in motion an “Apollo effect” in Israel: To encourage the next generation of Israeli children to choose to study science, technology, engineering and mathematics (STEM); to change their perception of these subjects; to generate a sense of capability; and to allow them to dream big dreams even in their small country. The non-profit aims to change the discourse in Israel and to encourage boys and girls to regard science, engineering, technology and math as exciting opportunities for their future. In recent years, SpaceIL has ignited the imagination of about 900,000 children nationwide, with the help of a broad network of volunteers.